The Caldwell Parish Clerk of Court's office is located in Columbia, LA, on 201 Main Street in Suite 1, however they primarily seem to rely on online indexing systems to allow access to vital records in the parish. To inquire the Clerk of Courts office further, they may be called by phone at (318) 649-2272, and emailed at caldclerk@bellsouth.net . 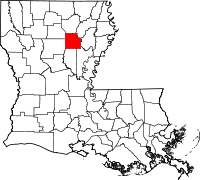 Caldwell Parish, home to the Marengo Suicide Swamp Ride, a yearly event that hosts thousands of ATV riders who careen through the swamps, is a primarly rural area. There are only three main communities in the parish, and most residents live outside of them. The population is only approximately 10,500, making it one of the smallest parishes in Louisiana with a population density of only 20 people per square mile. A single high school and four elementary schools serve the entire parish.